We have a wonderful community of riders here on The Crick. The friends, the horses, the adventures and the camaraderie have been a huge part of the life that I have here. So many rides together, so many shared joys and sorrows. Getting new horses, raising colts and fillies, losing older horses, mentoring juniors, sharing horses and adventures with friends from all over the world. We've all been through a lot together. We're an awesome team for putting on rides, sharing the work load and pitching in with whatever is needed - from putting out ribbons to pulling them after the ride to organizing and re-organizing bags full of various color ribbons on clothespins. We rake rocks, set out water tanks, keep the people and horses fed, make awards, find new trails, and do the yucky paperwork. It's work, but it's much more fun when it's done together. We also have various skills and talents and ambitions when it comes to horses and riding. This weekend our friends from the mountains came down to ride, as their trails are still too snowy and muddy. They brought a beautifully bred gelding that hadn't worked out for a previous buyer, apparently it had learned to buck. So... Connie to the rescue. Connie lives a little ways up the creek, splitting her time between Seattle and Oreana. 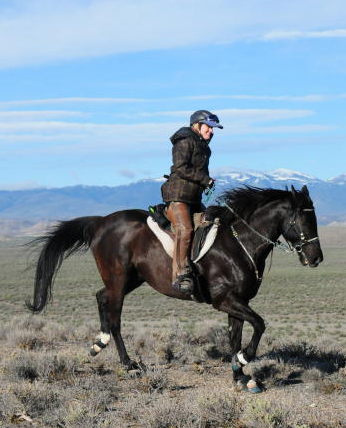 She galloped thoroughbred horses at the race track for 15 years and learned to quickly read a horse (young, strong, fit thoroughbred colts) and determine how to ride it, and how to stay on and in control while galloping around the track. She is also generous with her time and has helped many of us over the years. Our friend wanted Connie to get a read on the horse and figure out what he needed in terms of training to make him a good citizen again. Connie had put the first rides on him several years ago, so she knew him. It was a windy stormy day, but I don't think that matters to Connie. She started in the round pen and then took him to the arena (wind kicking up dust, trees blowing, things flapping). Circles and circles and circles, he had some buck in him. "I just let him buck, he got tired of it eventually". She wanted to ride him again the next day, and it was even crazier windy and gusty. Not a second of hesitation. "He was much better, I knew he would be. There's nothing wrong with this horse, he just needs a strong leader." Connie is a good friend, and a lot of fun, and I hope she knows how much we all appreciate her!